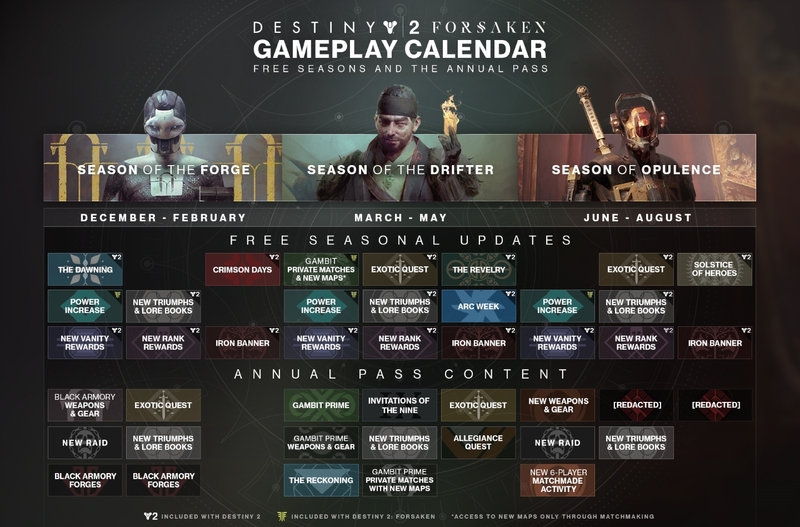 Our Destiny 2 Season of Opulence guide contains everything we know so far about all the content coming with Season 7 and will be updated with a release date, rewards and activities once more information is revealed. Destiny 2’s Season of Opulence is the last known season of content on the roadmap for this year, and it’s certain to arrive with a bang. Most notably, there’s going to be a brand new Raid, more weapons and armour, alongside a brand new 6 player matchmade activity. Take a glance at the roadmap and there are two “redacted” elements too, so we know Bungie’s keeping its cards close to its chest. We do know that the term “Opulence” suggests we’ll be revisiting Emperor Calus’ domain, though. Perhaps we’ll see all new activities centered around his narrative. For now, we’ve put together everything we know so far about Destiny 2’s Season of Opulence (Season 7), and we’ll be updating it further with all the latest updates and info once we know more. Stay tuned! Bungie is hosting a Season of Opulence community summit featuring some of the Destiny community's most prolific members. It'll be an opportunity for Destiny stalwarts to get hands on with some of the new content and offer constructive feedback to help better the upcoming expansion. This isn't the first time Bungie has enlisted the help of Destiny content creators, as it hosted a crisis community summit before the launch of Destiny 2's Forsaken Expansion. At that point in time, the game desperately needed saving and it certainly helped the game turn a corner. It's great to see Bungie going through the same motions that made Destiny 2's Forsaken expansion great. Here's hoping the Season of Opulence delivers! The Season of Opulence is due to arrive sometime in June and will run through to the end of August. From previous seasons, it’s likely Season of Opulence will kick off within the first week of June and come to a close towards the start of August. Who knows what Bungie has planned after its initial roadmap expires, especially considering its future content won’t be constrained by Activision Blizzard. This should give the team more freedom to take Destiny 2 in any direction it chooses, and here’s hoping it’s for the better. Here’s a roundup of all the content we know is arriving with Destiny 2’s Season of Opulence. Bungie is changing how Enhancement Cores for infusion work. Scrapper Bounties will be removed and Bungie will be making Enhancement Cores more accessible. When the next season starts, Scrapper Bounties will be replaced with a selection of daily and weekly bounties purchasable with Gunsmith Materials. We know there’s going to be a Power Increase, we’re thinking along the lines of 680-750-ish. There will be more Exotic Quests, Vanity Rewards, Triumphs, Lore Books and the likes of Iron Banner returning. As expected, the Season of Opulence will bring with it new weapons and armour to chase. One of the most exciting prospects is the all-new Raid. We’re not sure where it will be set, but there’s a chance it could be something to do with Emperor Calus, or at the very least, set within a similar “opulent” universe. We’ll be getting a brand new 6-player matchmade activity. We’d hedge our bets on this being an alternative to a Raid, or at least a grindable dungeon to some extent. Unsurprisingly there are many high Power Level players who simply don’t get to experience Raids because they don’t have a fireteam to consistently group up with. Perhaps this will be Bungie’s way of getting these players involved in similar content without having to commit so much time and effort. Finally, there are two mysterious pieces of content which will be revealed at a later date. Who knows what Bungie has in store, but here’s hoping for some extra PVP modes or sweeping changes to older content like the Blind Well and Escalation Protocol to make them more relevant.